3.5 out of 5 based on 30 bloggers and 12 commenters. 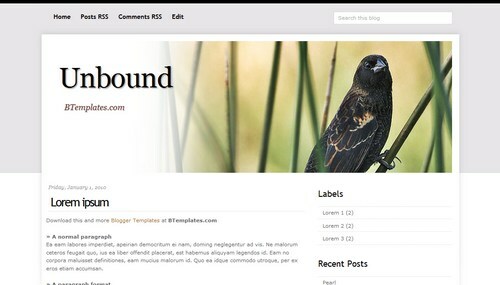 Unbound is a free blogger template with 2 columns and right sidebar. Excellent template for blogs about animals, to write a diary or photography. I think there’s a mix up with the demo. I can’t remove the title text. It might be considered by programmers that people want to use their own graphics (ie: logos) The title text is annoying and when I tried to remove it from the code, blogger put it back. Nice template, but not very customizable. Porque los campos de búsqueda, no funcionan??!!! siempre dice que no encuentra resultados, porque?? Se puede cambiar la imagen que está como encabezado?